Get ready to have cake truffles like you've never seen them before! Cake Gems are gorgeous candies, shaped like gemstones and filled with moist bites of cake. I first started seeing this idea floating around Instagram and Pinterest about a year ago, and I was immediately obsessed. Cake truffles and cake pops have become so commonplace, it's hard to really make them stand out these days--but molding them into gemstones and decorating them with glittering accents certainly makes them pop! 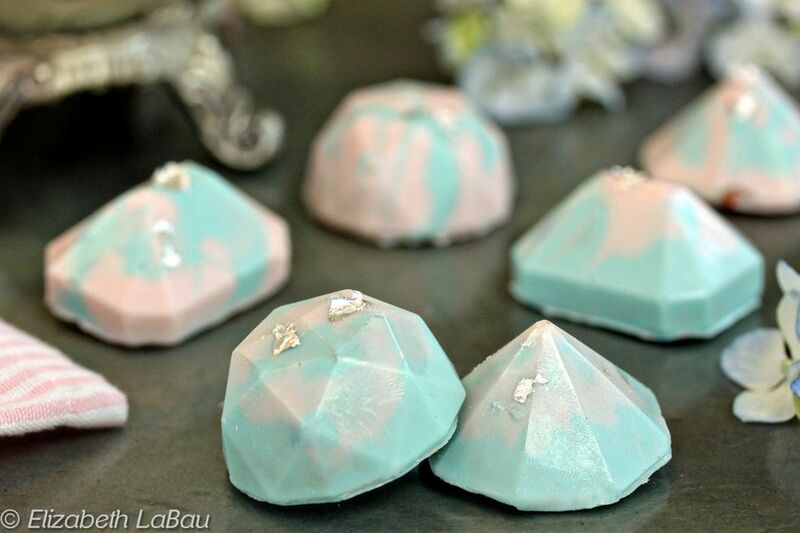 To make these gems, you'll need a silicone gem-shaped mold, like this. Look for one that's large enough to hold at least a tablespoon of cake, and that's flexible so you can easily release the candy when done. Because the mold you choose might be a different size, it's important to note that the yield on this recipe is an estimate only. Crumble the 8-inch cake layer into a medium bowl. You should get about 2 cups of cake crumbs from it. This recipe is very flexible, so don't worry if you end up with slightly more or less cake. Spoon 1/3 cup of the frosting into the bowl and mix it together with your hands or a rubber spatula until the mixture is well-combined. It should be very moist and hold together if you squeeze a ball of cake between your fingers, but not too wet or greasy. If the cake mixture is still a bit dry, add more frosting to get it to the desired consistency. Place the candy coatings in separate bowls. Melt them individually in the microwave in 30-second increments, stirring after every 30 seconds to prevent overheating. Spoon a small amount of pink coating (about 1/2 tsp) into each candy mold. Use a clean, dry food-safe paintbrush to brush the coating in a random pattern inside the mold. Don't worry about covering the whole interior, and don't worry about making it "pretty"—the idea is to give the gemstones an abstract colored pattern, not to make them identical. Refrigerate the candy mold for about 5 minutes, to set the pink coating. Spoon a larger amount (1 -1 1/2 tsp) of blue coating into each mold, and use the paintbrush to brush a thick layer of blue on the bottom and up the sides of the gemstones, covering the interior completely. The warm blue might melt the pink coating, and that's okay—it will soften the line between the two colors and make the pattern more organic. Refrigerate the mold again until the blue is set completely. Once the blue is set, fill each mold with some of the cake mixture, and press it down gently to compact it. Make sure you leave a small margin at the top of the mold for another layer of candy coating. Re-warm the blue coating if necessary, and spoon a small amount on top. Spread it out to the edges so that the cake filling is covered completely. Refrigerate for 10-15 minutes, until completely firm. Gently flex the mold and pop out the cake gems. If you want to use the optional silver (or gold) leaf, use a paring knife or x-acto knife to tear a small piece of silver leaf away from the sheet. Pick up the piece of leaf using the tip of the knife or razor. Lay the silver leaf on the candy's surface, and use a clean, dry brush to push it down and get it to attach to the candy and detach from the blade. Your finished Cake Gems can be stored in an airtight container in the refrigerator for up to two weeks. For the best taste and texture, bring them to room temperature before serving. Note: Edible silver leaf can be found online, and in some cake supply stores. It shares many properties with edible gold leaf, so if you want to learn more about what it is and how to use it, you can check out these articles: What is Gold Leaf and How to Apply Gold Leaf. Click Here to View All Cake Pop Recipes!